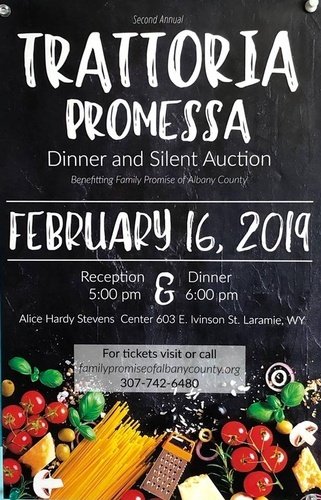 Family Promise of Albany County would like to announce their second annual Trattoria Promessa event. Now taking place at the newly renovated Alice Hardie Stevens Center. The evening will include a variety of appetizers, wine, an Italian-themed dinner, dessert, and a silent auction! Tickets are $50 for individuals or $90 for couples. Purchase online by clicking here, or call 742-6480. Vegetarian and Gluten-Free options available upon request. Guests may indicate seating preferences if attending with a larger party.